Lately, I've felt like the modern sandwich has been homogenized into flavorless nonsense. How did we get to a point where dozens of different fast food sandwich joints are essentially selling the same thing? Is a turkey sub from Subway really that much different than a turkey sub from Jimmy John's? While I'm not exactly sure how our sandwich identity crisis has gotten so out of hand, I do know that this most elegant of foods deserves much better than the constant replication that it's currently getting from mainstream eateries. Thanks to the valiant efforts of local Vietnamese restaurants, banh mi consumption is on the rise, but there's so much more that can be done. For a taste of what I mean, head down to Orem and check out Lomito's (180 W. Center St., 801-607-1602). It's a family-owned Argentine and Chilean restaurant that has brought a welcome dose of South American sandwich culture to our backyard, and it's a testament to the sandwich's ability to balance flavor and textures. While they're only available at a few places locally, the lomito sandwich is a powerhouse in Argentina and Chile. Like most sandwiches, versatility is a key factor in the food's success, but the basic foundation consists of thin slices of grilled beef tenderloin or filet, ham and fried eggs. It's typically topped with lettuce and tomatoes, but you might also get some mayo, avocado or pebre sauce depending on who happens to be running the grill. "It's better than chimichurri—less citrusy," Lomito's patriarch, Fernando Caballero, says of the Chilean salsa. A lomito typically comes served on a dinner plate of a bun that gets stuffed with all those gorgeous eats and sliced in half. There are some similarities between lomitos and traditional Mexican tortas, but where tortas hit their stride with experimentation, a lomito sticks to a tried-and-true blueprint. Armed with some fascinating cultural knowledge about this blockbuster of a sandwich—did you know that there's a Chilean variation called Barros Luco, which was named after one of the country's former presidents?—I ventured southward to Lomito's. Once you hit Orem proper, the restaurant isn't far from the Center Street off-ramp—it's close enough to the freeway that I'd consider it a spot to remember on any southbound road trip. The space is tucked away inside an unassuming strip mall, and it's easy to miss if you're not keeping an eye out. Once you're there, however, your first priority is to order anything with the word lomito in front of it. I happen to love the lomito Argentino ($8.59, pictured), which is about as perfectly balanced as any sandwich can be. This balance is the reason that the essential framework never really gets changed—it's hard to improve on a sandwich when it's dressed to kill like this. It's got that thinly sliced steak, grilled ham and a gooey fried egg bringing the salty and savory with the counterpoint of iceberg lettuce, tomato and mayo providing the sweet and crispy. The bread itself is crucial to this balance—it's like a toned-down version of focaccia that packs just enough spring in each bite to bring this party together. In addition to its namesake goods, Lomito's also carries a few other Argentinian sandwich staples. The choripan ($6.99) is a fist-sized explosion of grilled chorizo, lettuce, tomato and mayo that lands somewhere between a hot dog and a sandwich; and the Milanesa chicken ($7.99) is a sandwich that focuses on a lightly breaded chicken filet. Both of these sandwiches are also important to the Argentine diet, and the fact that they're all available under one roof shows that Lomito's has its bases covered. Rounding out the menu are deep-fried empanadas ($1.99-$3.99) and a decadent dessert called milhojas ($2.25). It's always a bit of a gamble when a place offers up empanadas—I've noticed quite a size disparity among these tasty, meat-and-cheese-stuffed pastries. Empanadas here are among the biggest I've seen, and they're deep-fried to a fry bread-like consistency. Many of the sandwiches on the menu offer a cheese empanada in place of fries in a combo meal, and it's a deal you should definitely take. If you happen to have room for dessert, the milhojas is a must. Think of a Napoleon cake made from layers of flaky puff pastry and thick, dark dulce de leche. The sweetness bomb is a lovely jolt of contrast after all that savory sandwich sampling, and it's certain to end the meal on a high note. 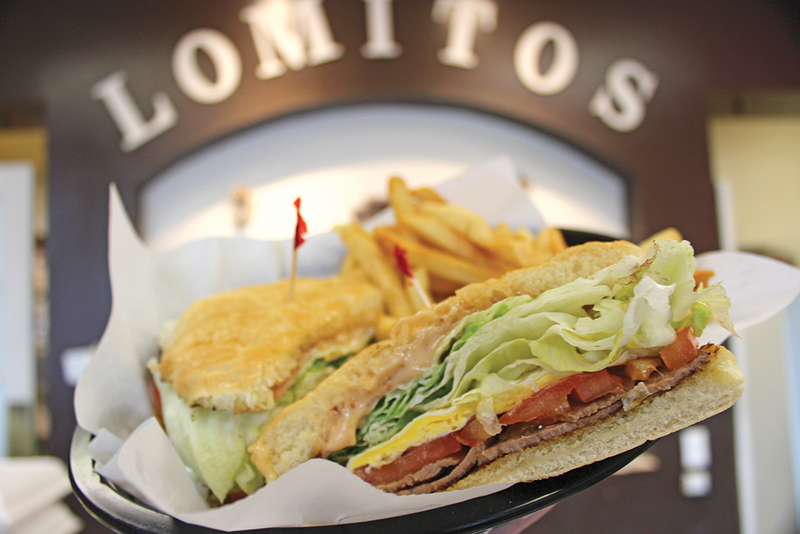 For those currently in the throes of severe sandwich doldrums, a trip to Lomito's will surely snap you out of it. Its well-rounded menu of stacked Argentine and Chilean sandwiches offers up a wide variety of meal-worthy offerings that come with a bonus peek at South American sandwich culture. I'd take a lomito joint on every corner over a Subway any day of the week. Open: Monday-Saturday, 11:30 a.m.-8 p.m.